The Cool House: Recession, what recession? “The person who buys this kitchen isn’t polishing their own hardware,” said Mr. Peacock, stating the obvious. The Private Collection, he said, is an heirloom-quality room, with more detailing, hand-selected woods, those silver knobs, and a higher price, about 25 to 30 percent more than his other kitchens, he said, which on average, including the appliances and countertops he recommends, go for $185,000. 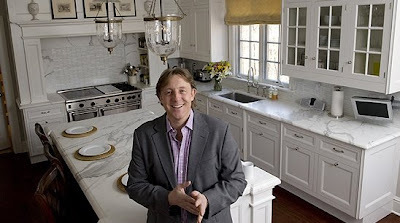 These kitchens are going into multi-million dollar quintessential estates so you would expect them to be outstanding quality and for the price to reflect that, but is it just me or does the featured kitchen look a little "standard"; it's like a lot of white kitchens I've seen for a lot less money. How are people to know I didn't get my fixtures from Restoration Hardware? Finally, what is that TV doing stuck out on the right? It's surely an afterthought, and for all that money I'd want many hours of thoughtful planning to go into the design.